"Oh, you are here. I thought maybe your mother would take you flying on such a beautiful day." Iguana lifted his head over the edge of the nest. "Good afternoon, Mrs. Rattlesnake," he said. "No, Mother says it is not yet time for me to fly." He sighed. More than anything, Iguana wanted to fly. "Quite right, I'm sure. Mrs. Eagle has always been so careful with her children. "I'm not a child!" Iguana exclaimed. He stepped back until he jammed the bank of the nest, the tip of his tail pushed through the twigs. Retracting his tail, Iguana nosed the twigs back into place. "Oh, no, no, no. I didn't mean to imply any such thing. I can see how handsome you are becoming -- an adult any day now with offspring of your own." Mrs. Rattlesnake inched forward. "May I rest on the ledge next to you? The air is so thin up here." She coughed softly. With a dip of his head, Iguana invited her to rest near him on the sunny rocks. Mrs. Rattlesnake looped her elegant body and rolled to the tip of the ledge. Iguana looked away from her to the canyon below where a narrow road twisted alongside a river, bordered on its opposite bank by rocky cliffs. "In fact," Mrs. Rattlesnake said, "I'd venture to say your mother has left you in charge of the nest." "Yes." Iguana expanded his chest until his scales rippled. It was difficult to maintain the pride of his position all alone tucked up in the cliffs. Now he had an admirer. "Not only must I keep the nest in order, I must warm the Unhatched Ones." Iguana positioned his body over the eggs to show Mrs. Rattlesnake the delicate nature of his task. He held his weight on his legs until they trembled so she could see he would never crush the eggs. "Magnificent," she said. Her tongue flicked, testing the air. The exquisite grace of her tongue intrigued him, the way it seemed to hover like a hummingbird dancing above nectar. Iguana vowed to practice moving his tongue that way with his next words. "Especially difficult," she continued, "given your, hmmm, special circumstance." "Special circumstance?" Iguana faltered. He couldn't help it; he had already failed to practice Mrs. Rattlesnake's elegant speech. "Naturally your mother told you that you were... special?" Mrs. Rattlesnake looked at him directly, her nose a perfectly aligned triangle. "That you are, hmmm, cold-blooded?" Cold-blooded? His mother had never used that word. Maybe this was a terrible disease of the blood. Was he going to die? Iguana sat silent. "Oh, my dear, I am sorry. I thought you knew. But surely you don't think you're... an eagle?" "No, of course not." 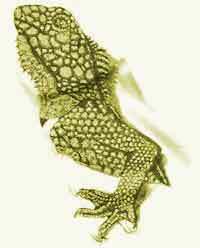 Iguana arched and stiffened his dorsal crest. Did he look stupid? "I'm curious my dear." Mrs. Rattlesnake stretched into a long line, twisting and rubbing herself on the rocks. "What has Mrs. Eagle told you about your history? About your egg mother?" "Mother was there at the very moment of my birth," Iguana said. He unfurled his tail and sat down. His dewlap expanded until it hung over the nest edge, facing down into the canyon. "She was there at my birth," he repeated. Here he was on safe ground; he knew his birth story by heart. How Mother had chosen him though he was not hatched to her and she could not love him more and it did not matter that his egg had been so different from these eggs that he now protected. "There had been a terrible accident. Men and their machines," Iguana said. Mrs. Rattlesnake hissed sympathetically. "Malicious creatures," she muttered. "Mother's eye was attracted by something on the roadside - it was my egg mother, dead, and surrounded by her broken eggs. Mother swooped down to help at the precise moment I broke out of my shell." Iguana smiled and tapped his tail. "With her beak, she flipped me onto her back and flew me up to her nest. Mother always says it was prophetic she happened upon the road that day." In spite of himself and his age, Iguana allowed a silvery tear to escape his eye. He loved his birth story. "Prophetic, was it? That was what she said, was it?" Iguana narrowed his eyes and shook away his tear. Mrs. Rattlesnake must not foul his birth story. Iguana looked out over the canyon hoping for a glimpse of his mother. Even more, he yearned to spread himself horizontally the way he did in the morning when he basked, sharp as a leaf's edge, and then to slice a cloud in two as he soared above the canyon floor. But lately, Iguana had begun to worry that he would never fly. Surely he was old enough now to learn. He had watched the nestlings of his neighbors hatch and grow and leave their nests. He should be among them. Unless. Unless there was something wrong with him, maybe something related to this matter of the cold-blood. Iguana shook his dewlap angrily. Whatever it was, he should know the truth. "One hears rumors of course," Mrs. Rattlesnake said. "Cliff folk are such terrible gossips. Myself, I never listen to rumors." After a pause she said, "Still, one hears things... the unsavory eating habits of eagles for instance. And their peculiar love of the open road." "Stop!" Iguana could hear no more. "Don't talk to me," he shrieked. He rushed to the far edge of the nest and buried his head under the fallen feathers of his mother. "There, I've upset you again. I am desolate. Come, join me at the edge to admire the beautiful light as it descends." Iguana did not move but he looked out over the edge of the nest to the light beyond, which was textured like scales. The sky was geometric in parts, overlaid here and there with drifting mist. Together they watched the horizon of the west until the sun's halo was broken by the shadow of the treacherous cliff rocks.